There is no direct bus from Veliko Tarnovo to Plovdiv, so I went by a very slow train. Two students from the university in Veliko were in my compartment and were eager to practice their English. Forward thinking people in Bulgaria try to learn English, but outside of Sofia they have very few opportunities to practice. I was more than willing to accommodate these pleasant young women. It helped pass the time for part of the trip. Unfortunately they didn't go all the way to Plovdiv. I arrived in Plovdiv mid-afternoon and linked up with two Aussie backpackers who were also looking for a place to stay. They had a better guidebook than me and I had a phone card, so it worked out. They were the ones who told me about the tourist office in Veliko Tarnovo I had missed. They got the last room in a hostel on the east side of town and I ended up in a Soviet era hotel on the west side. I lost track of them after that. 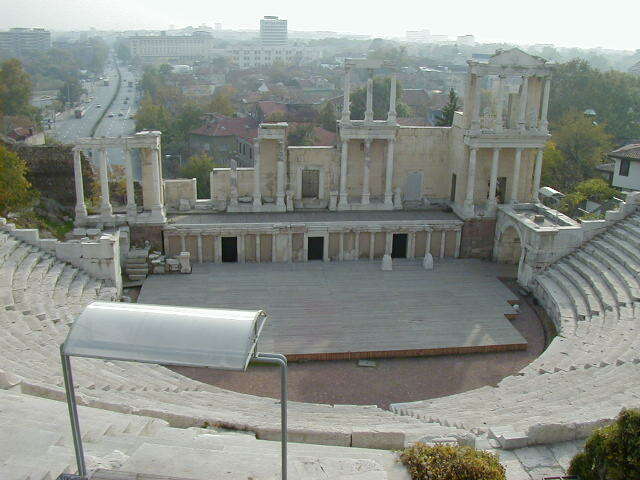 Plovdiv is OK. It has some nice sights, but they are scattered around and can be hard to find. 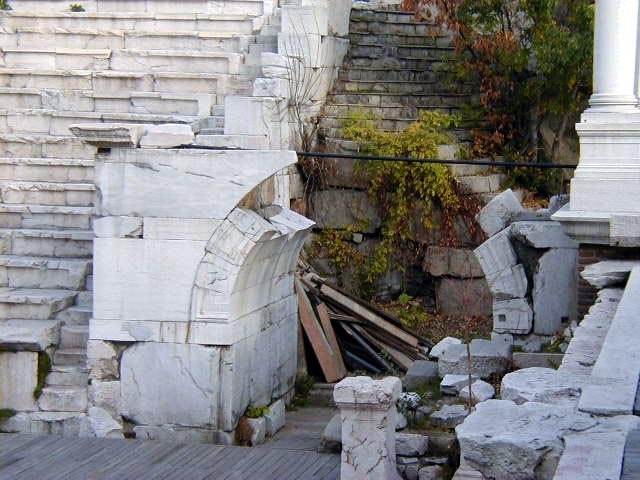 The Roman Amphitheater here is only approachable by going over the top of the hill it is built into. If you don't know where the hill is, it is difficult to find. 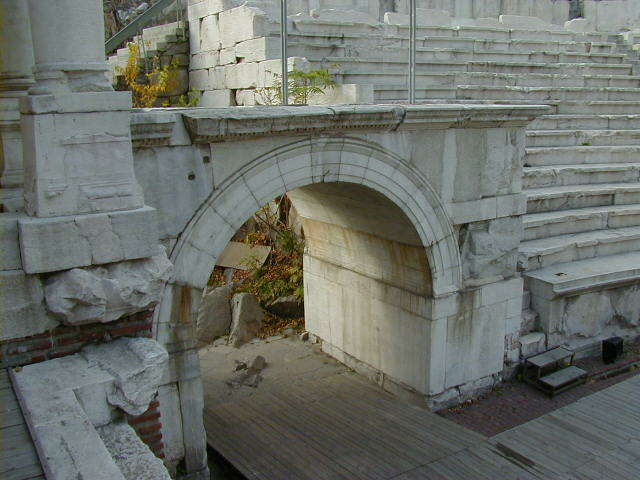 The amphitheater is in good condition and still occasionally used for concerts. 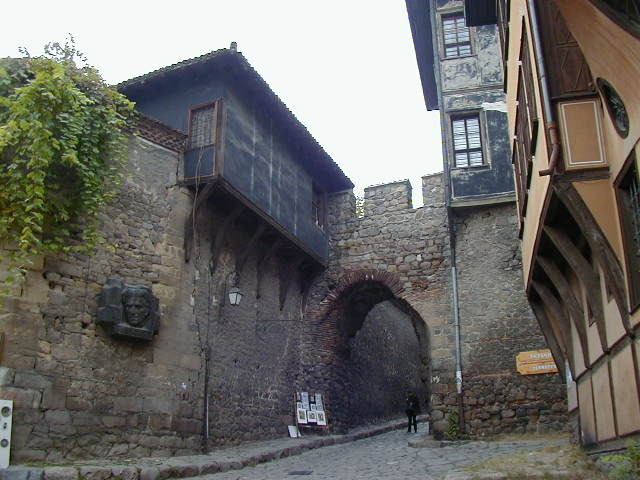 The last picture is of the outer walls of the Church of Constantine and Elena. While I was looking for it an elderly couple saw me wandering around with a lost look. I did that a lot in Europe. The man figured out I was looking for the church and tried to talk to me in German and French, then gave up and led me there on foot. I was really impressed by his kindness; he was quite old and it looked like walking was a uncomfortable for him. There are some very nice people in Bulgaria.